I know if you are a regular reader you might feel I've abandoned you... Really, I think about what I would write every day. Every time I'm stirring a pot of something, or wiping off the dining room table for the 10th time in a day, when I'm so excited about learning about Hannibal and the Punic Wars that we scratch the rest of the afternoon to make rough puff pastry and bake up baby elephant ears. (I even took pictures of that, thinking I might get to setting pen to paper about it!) Time elapses and I don't need to make excuses for it. I have taken to embracing that I'm wrapped up in the hug of a two-year-old, or busy diagramming sentences and reading about Hannibal. The food world will still be there when these boys have all of a sudden grown into men and I wonder where the days of hectic life went. Those days I try not to daydream of, when my small house is trashed with stuffed animals and legos and it's 4 o'clock and I haven't thought about what supper will emerge from my hands. The folks at PRiMO preserves reached out to me again this fall and asked if I'd like to host a giveaway of one of their beautifully packaged gift boxes. I felt really guilty because I really love their preserves and felt like their preserves deserved a more prominent place in the food blog world than on my all but neglected site. My metrics are a sorry state since I've taken to one post a month, and as far as "career" bloggers go, I am just plain terrible at updating social media. Even so, I am so flattered that they like my little corner of the Internet, and I'm pledging my best to get the word out about their line of preserves. So I'll keep the rules simple: just leave a comment on this post before midnight on December 10th (that's next Thursday) and I'll assign a number to each commenter in the order they appear and select a winner at random. You'll receive a gift box of 4 jars of PRiMO's signature preserves, one jar each of limited release Holiday Pumpkin Spread, Spiced Cherry Preserves, Berry Pasilla Preserves and Raspberry Habanero Preserves. 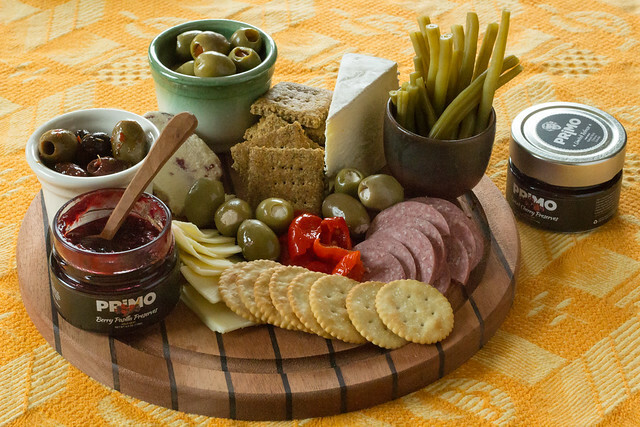 You can read more about PRiMO and their preserves line on their website. I know you'll enjoy all of the flavors for yourself, but it would also make the best host/hostess gift or "secret Santa" type gift. You could also separate the jars, I'd imagine one would fit nicely in the foot of a stocking! I hope you are happy happy during this Christmas season, even in spite of all the terrible news accosting us every single day. Even in the midst of that I think it's more important to concentrate on what good things come each day, what blessings we have to be thankful for. Sweet things that come in the mail, and genuine artists that create!